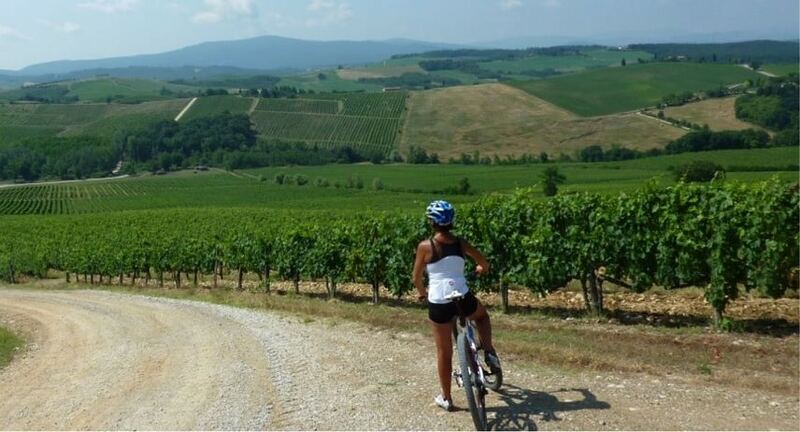 A glorious bike tour in Chianti for an unforgettable day ! We believe there is no better or more exciting way to experience Tuscany than cycling. 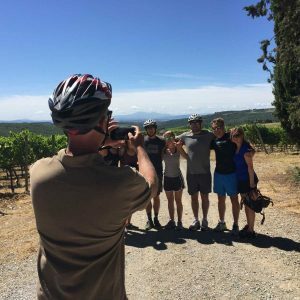 Plan a bike tour in Chianti ending your cyling at a local winery, to taste this delicious Tuscan product and get to know much more about its origin hystory. Chianti wine is a mysterious and exciting world to discover, for wine-lovers as well as for those who are simply “wine-curious”. It’s a vast swimming pool of sensorial emotions. Building a true connection with the reality of wine, or living a proper wine adventure, does not only mean visiting a cellar. Wine is, firstly, a historical and cultural expression of a territory and its gastronomic tradition. Therefore, not only is wine an exquisite nectar, but a hedonistic gift to yourself, a way to uncover all your senses. 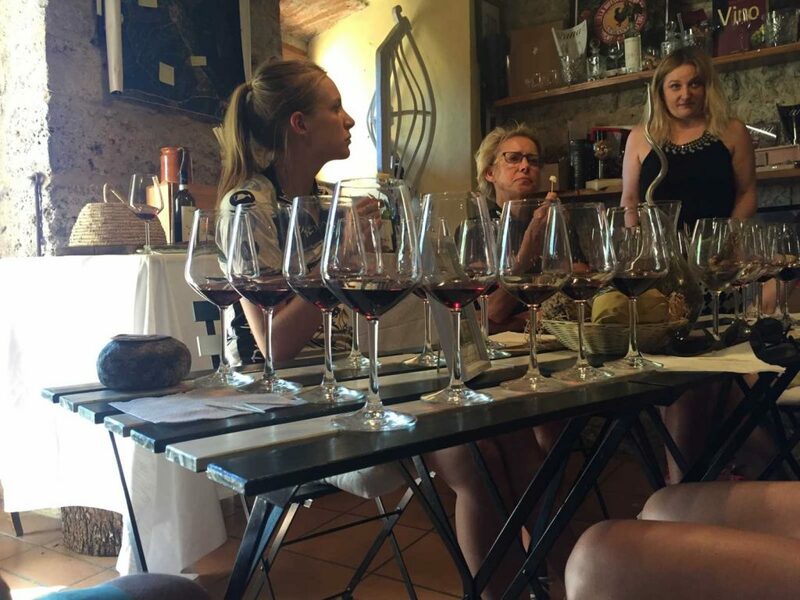 Talking about wine, on your bike tour in Chianti, means taking a virtual trip through past, present, and future, an imaginary voyage into the life of vines, wine regions and territories, historical events, human knowledge, local produces and typical cuisine. In a glass of Chianti wine you can read a story: the interpretation of terroirs by human know-how evolving through time. Discovering good wines means more than simply savouring the divine nectar. True wine enthusiasts look for a full-fledged experience, one that is able to leave an indelible footprint in their mind, a sensory memory of wines, foods, places and people. Living a real wine experience means diving into a journey of discovery and internalization of the world of wine. One may start by visiting wineries and meeting producers, in order to understand their vision and the way their wines narrate and interpret a territory. However, the value added of a full-hearted wine experience is the educational approach. It is impossible to delve into the world of wine without the right tools, so during your wine time the presence of a real Wine Expert who can guide you into the wine jungle is indispensable. A Wine Expert is not a seller, but an ambassador of a palette of flavours and territories, able to communicate professionally the oenological story of a glass and to stimulate the smell and taste to discover the origins of wine aromas. With a Wine Expert, a Winelover can satisfy both its educational and emotional desires and learn to understand the stories a wine can tell with its colours, perfumes and tastes. Attending an exclusive Wine Experience means embarking an emotional journey through areas of production, wineries and territories, finally encountering a space for tasting and educationthat integrates quality wines and typical food, led by a professional and prepared specialist. A must for all bike and nature lovers. Best way to explore Tuscany and its charming white roads across endless vineyards. Great for shape and sustainability. Slow down, breathe, fill your eyes with green, sun, pure beauty! Loving it.